We are a non-profit organisation that was born of a project carried out from the end of 2004 to 2008, when the entity was established. The three founders are Paco Salvador, Dolores Borrás and Álex Salvador. 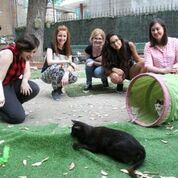 El Jardinet dels Gats was established in order to provide care for abandoned and stray cats in the Ciutadella district of Barcelona. 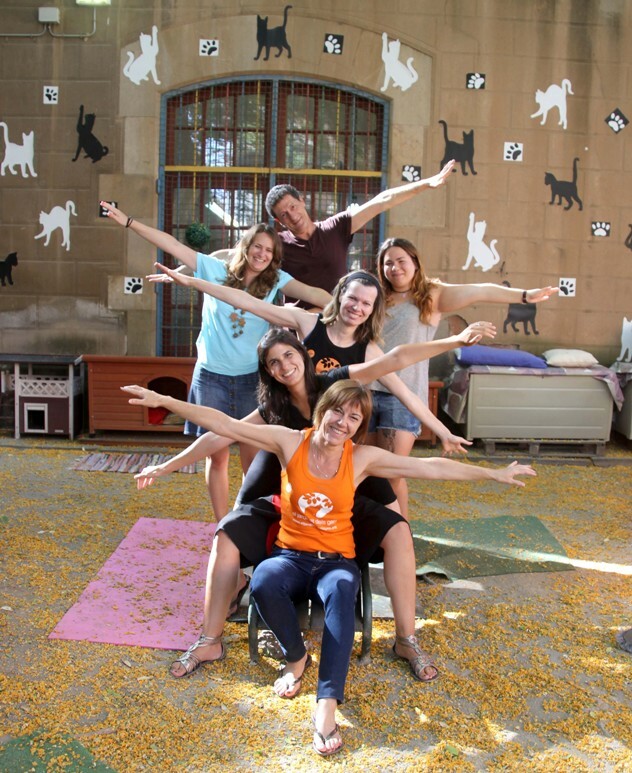 The Jardinet dels Gats is composed of a team of solely volunteers who strive to improve the welfare of the cats in our district. We are dedicated to the care and protection of feral and abandoned cats with the aim of improving their quality of life. 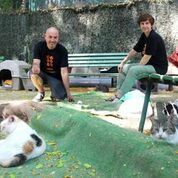 We rescue stray and abandoned cats in Ciutat Vella with the aim of taking them off the street and finding them a secure place to live, or adoptive home. Once they are rescued, they are treated by a dedicated team of veterinarians who collaborate with the Jardinet. They are tested for the Feline Leukaemia Virus (FeLV ) and the Feline Immunodeficiency Virus (FIV), given the FVRCP and leukaemia vaccinations, chipped, treated for internal and external parasites, and spayed/neutered (depending on their age). Following that, we find them a temporary foster home where they can stay all the time they need until they are adopted. We believe that cats on the streets live in poor conditions, especially in a district like Ciutat Vella, the reason for which we do whatever we can to reduce colonies if possible or, in the event that they are secure spaces, we establish them as protected colonies. We also tell people about the work we do and look after the cats, thanks to the help of our volunteers, vets, sponsors, foster homes, teamers and, of course, cooperating entities and special collaborators. We carry out a diverse range of activities, fun as well as educational, in order to raise money so we can carry on doing what we do. 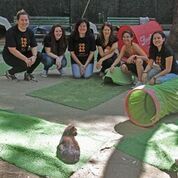 We also attend fairs and events in order to spread the word about our work and fund raise so we can carry on looking after stray and abandoned cats in the Ciutat Vella district. We focus on launching new projects which allow us to be self-sufficient, as well as raise money to carry out activities and maintain the cats, which includes awareness campaigns amongst others. We form relationships and encourage collaboration with other organisations in a diverse range of fields, including those of animals, so our work can go beyond just the care and protection of cats. We collaborate with community organisations, participate in social projects and get involved in cases where there are people vulnerable or at risk of social exclusion in order to confront emergency situations whereby there are animals at risk as a result. We also participate in projects with organisations with minors and prison inmates, and any other social projects where we can be of some assistance. We have carried out many different projects some of which include the children of the Aldeas Infantiles SOS children’s village volunteering at the Jardinet, and the social inclusion project dubbed Gats Quatre Camins which involved the inmates of Quatre Camins penitentiary centre, in collaboration with the Kan Chispis animal protection organisation. We also take part in common projects with the different organisations in the neighbourhood, as well as collaborate with residents’ associations and traders in Raval, Gótico and the Barceloneta…….in this way we are building a solid network helping us to combat problems with cats and people who, in most cases, are at risk of social exclusion, have been evicted from their homes or quite simply due to the lack of resources can not look after their animals properly. We attend to the elderly who have to be moved to care homes or who have sadly left us and don’t have family to take care of their cats. We are a partner organisation in an internship project for French students within the European Union Leonardo programme framework. So far it has proven to be a very rewarding experience for everyone involved. We give talks and carry out workshops with children in day care centres, schools, activity centres and community centres, as well as work with people that have poor adaptation skills for diverse reasons. We carry out awareness campaigns which emphasise the need for sterilisation and microchipping, as well as encourage adoption and other responsible practises. Always promoting respect for life. We are very active on social networks including Facebook, Twitter, Instagram, Pinterest, Youtube and Vimeo. Finally, we have a website, blog and forum where we share information on the activities and other actions we carry out. We believe in a better world and that it is down to us and our skills to change the current conditions in which many stray and abandoned cats are living in. They have a right to a decent life and we strive to make that possible, thanks to the work and effort made by everyone involved. Everything we do, we do willingly and eagerly. It is all done voluntarily but we are committed to our cause. In addition, we are organised and responsible all the while being aware of our skills and limitations. We maintain a positive and enthusiastic attitude so that we can learn and improve everyday, thus helping them to better their quality of life and ours at the same time. 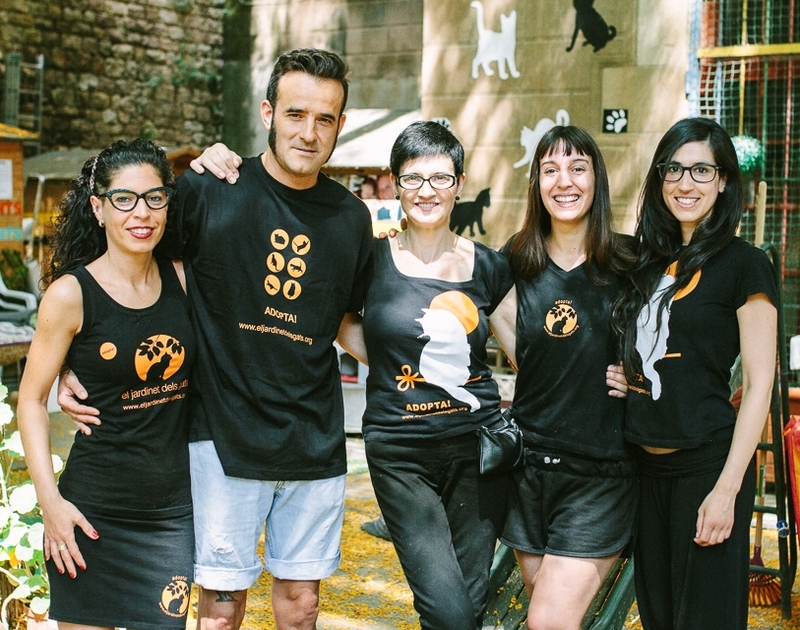 Finally, we work with love, respect and responsibility for the cats and for everyone that comprises the Jardinet dels Gats team. Throughout the 10 years of the project, more than 1000 cats have been rescued from the streets of the Ciutat Vella district and rehomed. We believe that cats need to live in houses and that the streets of Barcelona aren’t a secure place for them, especially that of the Ciutat Vella district, where there are very few places to find shelter. With regards to feral cats, they are taken to live in our controlled colony where they are safe and secure. Wherever possible, we also try to socialise them and find them a home. 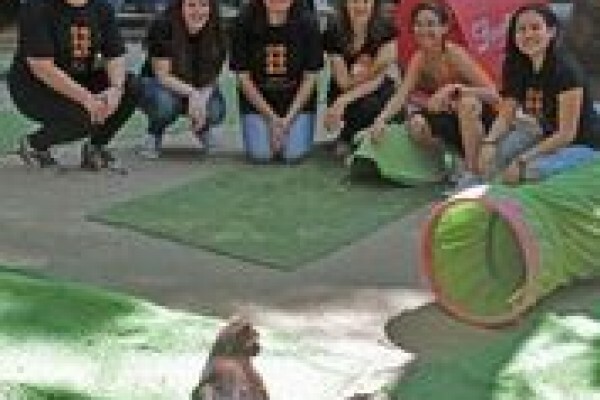 Fight for the welfare of the cats in the Ciutat Vella district, as well as contribute to increased social awareness for the protection of and respect towards animals. Love for animals. Our love for animals, and our will to try and socialise cats in danger for a happy and decent life, is what unites us. Transparency. We aim to make sure that all our efforts are public and easily accessible to everyone. Conservation of life. We are fully committed to never killing cats that have an illness but can still lead a fully and happy life. Positive attitude. We are optimistic and willing . We work with spirit and focus on finding solutions to problems. Open to everyone. Everyone has a place in the Jardinet. Whatever support, help, assistance or ideas can be provided are gratefully accepted. Mari Borrás, Paco Salvador and Álex Salvador had always cared for abandonded dogs and cats in one or another. However, towards the end of 2004 is when they really started doing it in a more organised fashion, in the way of the Jardinet dels Gats project, in the Ciutat Vella district of Barcelona. 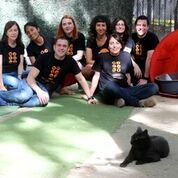 In 2008 the Jardinet dels Gats organisation was founded following many years of work with abdandoned cats in Raval and the other neighbourhoods in Ciutat Vella. They started their work with the cat colony in the Jardinet itself. 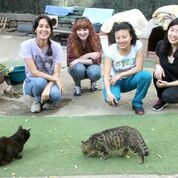 The tasks involved organising the space, and spaying/neutering and taking care of the cats that lived there. Slowly but surely the organisation started to gain more and more volunteers until one day, the Jardinet featured more than one hundred. This comprises a small tribute to all their work and dedication, and all the time they’ve spent caring for and respecting abandoned animals. 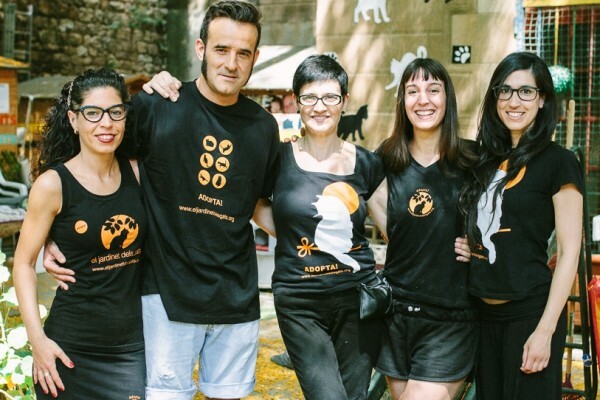 Unfortunately, in 2013, we lost Paco Salvador and Mari Borrás but the example they led helps us to carry on making one dream a reality, which is to give a second chance to abandoned cats in the Ciutat Vella district of Barcelona.